Foam From Above: New Nerf Blasters for 2017 - the story continues! The Road To Toy Fair. New Nerf Blasters for 2017 - the story continues! The Road To Toy Fair. The road to Toy Fair continues! Nerf let loose a slew of information on new releases, from Geek.Com and Popular Mechanics say hello to the newest upcoming additions to the Nerf Arsenal. Don't forget to check some of the previous release info Here and Here (some items were scheduled for 2017, but are readily available. It happens, certain areas are subject to availability. Bring the power of three firing modes with one epic blaster! The NERF MODULUS REGULATOR blaster features single-fire, burst-fire, and fully motorized blasting power. The REGULATOR blaster is customizable and compatible with accessories within the MODULUS system, sold separately, so fans can build their blasters and have the ultimate blasting experience. Includes two 12-dart clips and 24 MODULUS darts. Requires 4 C batteries, not included. Available at most major retailers nationwide and HasbroToyshop.com. Experience double-barrel MEGA blasting power with the NERF MEGA TWINSHOCK blaster! The pump-action blaster shoots two MEGA darts at a time, sending darts flying up to 90 feet! Want to shoot one dart at a time? The TWINSHOCK blaster has a single-fire option. Includes 10 MEGA whistler darts. Available at most major retailers nationwide and HasbroToyshop.com. Hone your skills and hit your mark with the NERF N-STRIKE ELITE ACCUSTRIKE RAPTORSTRIKE blaster. This clip-fed blaster with pop-up sight, adjustable stock and bipod helps players line up their shot and to aim with precision and confidence. 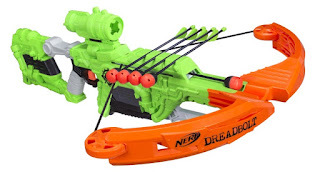 Includes two six-dart clips and 18 ACCUSTRIKE series NERF darts. Available at most major toy retailers and at HasbroToyShop.com. Outsmart and dominate the zombie hordes with the ZOMBIE STRIKE DREADBOLT blaster. The first-ever arrow-firing ZOMBIE STRIKE crossbow, the DREADBOLT blaster can take down zombies like never before. Use the detachable scope to line up the target, aim, and fire! Includes five arrows and detachable scope. Available at most major retailers nationwide and HasbroToyshop.com. Fight off aliens with the new ALIEN MENACE VOIDCASTER blaster! 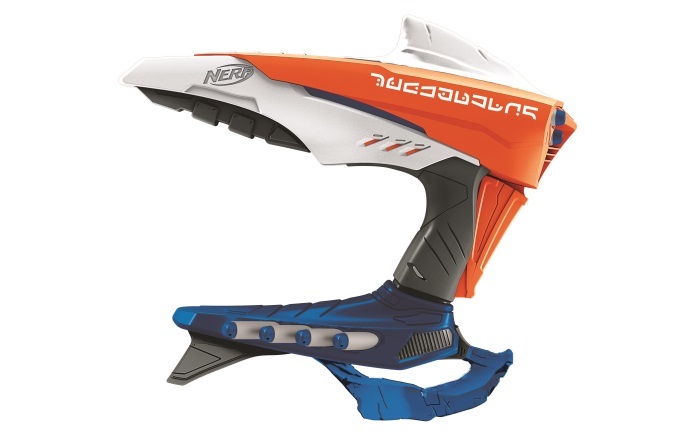 The blaster’s unique styling and pump action power gives NERF fans an edge against the intergalactic foe. The VOIDCASTER blaster fires four darts in a row without reloading and has storage for an extra four darts for easy reloading. Includes 8 ALIEN MENACE Elite darts. Available at most major retailers nationwide and HasbroToyShop.com. Still no press release that's been sent to me on the Nemesis - but it'll be $100 in the U.S. when available. As soon as I get one, it'll get posted! I have some opinions to post on these blasters too, they're coming up later this week.